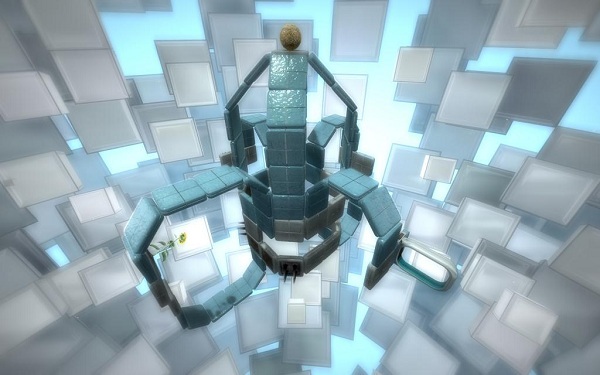 Puzzle Dimension PS3 Review. Overall, Puzzle Dimension is a simple, yet fun and addicting game that most people will enjoy. 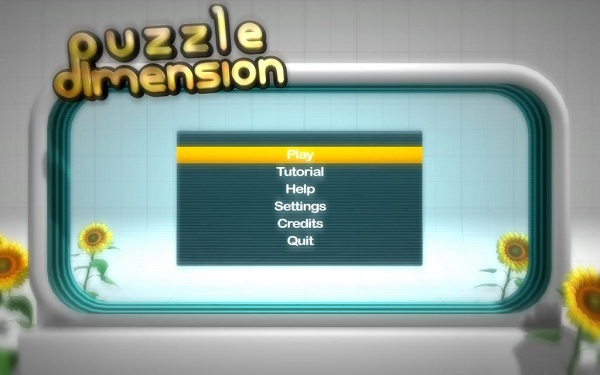 Puzzle Dimension is the first title created by the company Doctor Entertainment. While the company itself might be brand new, the founders have worked on games before such as The Darkness, Riddick, some of the Battlefield games, and Kula World. Puzzle Dimension shares a lot in common with Kula World and those who loved that game, will love Puzzle Dimension. 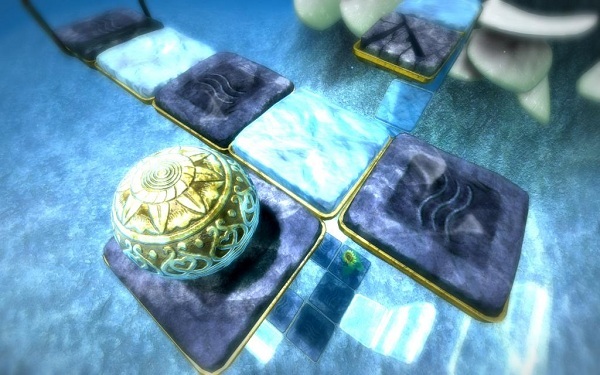 The gameplay for Puzzle Dimension is pretty easy to sum up and like most puzzle games is simply meant to challenge and keep the player focused and challenged. 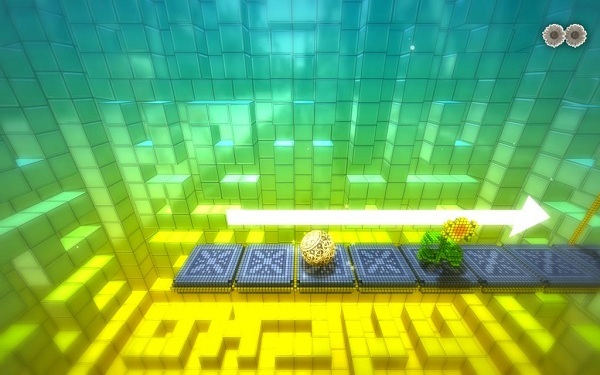 The game has the players controlling a little golden sphere as it rolls around on a 3-D labyrinth trying to collect little flowers and then get to the portal at the end. It sounds simple, but 'dimension' isn't in the title for no reason. 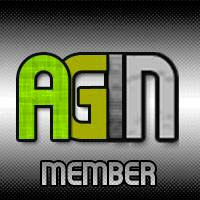 As the player moves around on the playing field he will roll up, down, and all around in a crazy gravity defying path. No matter where the player is gravity is always down and as such gravity changes based on where you are. Say, for example, that during the course of the maze you roll down what looks like a steep cliff, instead of falling, you would follow the ground and gravity would twist so that what was once down, is now straight. While this makes for some interesting puzzles and engaging environment, it can be a problem at times if you rush due to the camera changing. Countless times I would find myself jumping off the edge and too my death because the camera changed just as I was hitting a direction button. While it wasn't very common, it can be quite a pain for those trying to race through the levels to get high scores. One of the upsides to Puzzle Dimension that makes it superior to its predecessor Kula World is the removal of the time limit. There is no rush to complete the puzzles other than a high score so people who simply want to focus on thinking ahead and solving the puzzle don't need to feel rushed. If you get stuck, feel free to move the camera around, look up and down and plan your moves out ahead of time. 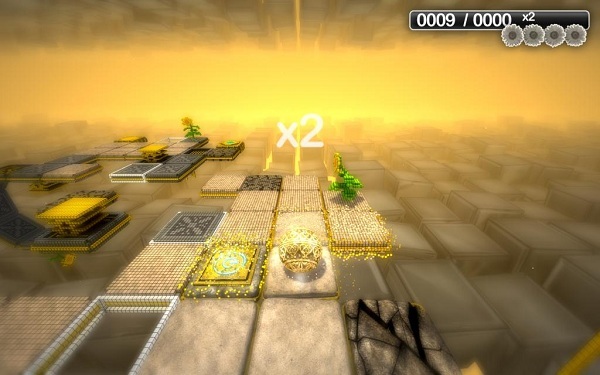 Puzzle Dimension mixes up each puzzle by adding different tiles that do different things. Ice tiles cause you to keep rolling until you reach either the edge or a different tile, cracked tiles break after you jump off them, sand tiles force you to jump and make rolling impossible, and many more. Puzzles are divided into 'clusters' with each cluster introducing a new tile and adding to the complexity. This added difficulty helps and means that no matter how skilled somebody is they can slowly work up their talent until they've figured out. Regardless of if you are a puzzle fan or not, the game is addicting. Even when various puzzles would frustrate me to no end and cause me to quit, I'd find myself going back and trying again. 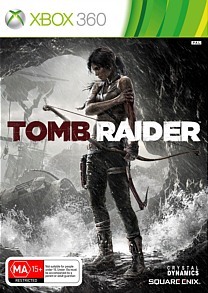 The game is capable of keeping a constant and well-balanced challenge curve. It starts ridiculously easy as you learn the controls, but eventually gets harder and harder slowly pushing you farther. Graphically speaking the game is interesting. It's HD and supports 3-D and while the graphics are cool there is only so much you can do when the entire game is a ball rolling around on square tiles. The concept is original though in that before you roll over a tile it is a pixalized low graphic tile, however, upon rolling over the tile it transforms into HD graphics. This change has a few useful purposes. It not only lets you see what tiles you've been and track your route when planning ahead, but it also gives completionist something extra to do and adds another level of difficulty on each puzzle. One of the downsides to the game however, is that there really isn't much point to getting a higher score. Unlocks are based on puzzles completed, not on points, and there is no online leader boards or other ways to compete. Simply put, the only thing a high score does it let you look at it and feel special. Sure, looking at your high score and trying to beat it is fun, but it doesn't really add much and just seems pointless since there is little point to replay levels you've completed. Puzzle Dimension features one hundred different puzzles to solve which means you will have hours of playtime as you try to solve each puzzle. The game is also relatively cheap meaning tossing down the money for it if you love puzzles should be a no brainer. However, be advised that the replay value is pretty low. Once you have solved a puzzle there is little reason to go back because you already know the solution. It's like being asked the same riddle over and over, sure you can answer it quicker, but that's because you know the answer. It would have been nice to toss on the option to make your own puzzles as well since that would have given it replay value and allowed players to customize and have fun. Overall, Puzzle Dimension is a simple, yet fun and addicting game that most people will enjoy. It suffers from a few rare and minor camera issues, the lack of any form of online, and the inability to make custom levels. It is still a fun and engaging puzzle game however so if you love puzzle games and enjoy testing your brain than the cheap price should be an even better bonus. However, if you aren't a fan of puzzle games while it might be fun anyways, the money might be better spent elsewhere.